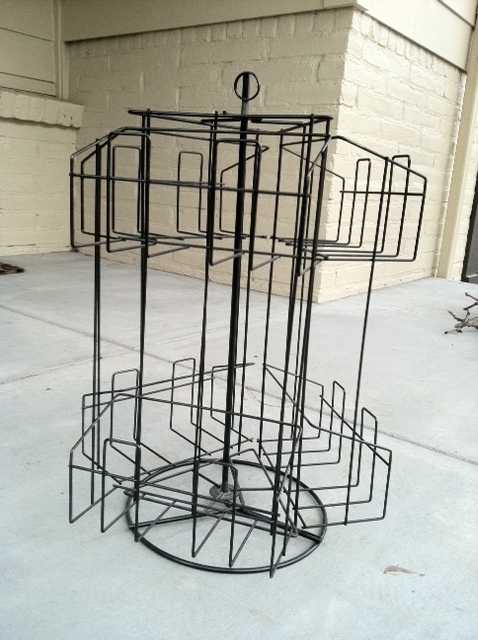 My friend Jonell and I found this little round, swivel rack at a flea market last fall. It swivels and has a sweet little clipthing for a sign at the top. Jonell picked it out as something she could use for wet mittens and gloves during the winter. I thought that was pretty innovative. But after the winter, Jonell gave it to me. She said it didn’t fit where she wanted it, so she was passing it on to me or donating it. See, I admire Jonell. She’s a minimalist–truly. She doesn’t buy things because they’re cute and she’ll figure out what to do with them later. She buys things for a purpose. If they don’t work, she doesn’t store them away like most of us. She gets rid of them (like the rack). But I’m not a minimalist. I am getting better at walking away from things that are just cute, and I’m getting better at sticking to a purpose when I shop. I think having limited storage and a written budget has helped me see the light in this matter. But with all of that said, it is an awesome rack and I do love repurposing things. I’ve been staring at it for a month now trying to decide what to do with it. For now it’s in the dressing room holding some extra shoes, but I don’t think it will stay there. Something will strike me. I’ll just hold on to it until it does. 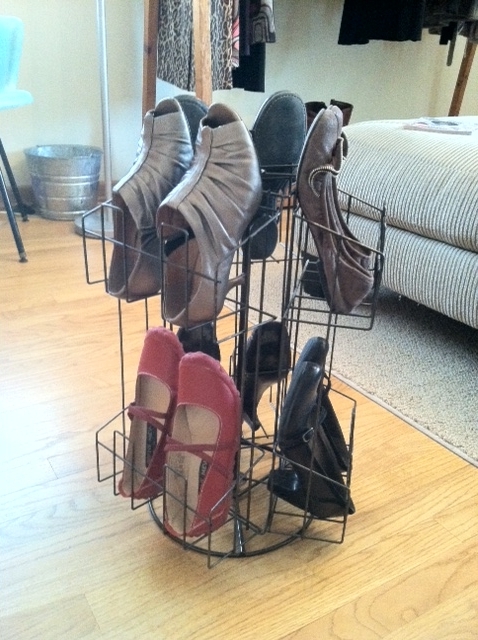 I think it can be so much more than a shoe rack, right? You have a gorgeous rack! It doesn’t fit too many shoes. Could it work for jewelry? Purses? Something in the kitchen?